Social Integration For Automotive Dealers - Now more than ever auto dealers need an all in one marketing platform that delivers results! We have a few years jump using our platform as an engine and building layers of applications for auto dealers – and with impressive results. It’s a battle for supremacy: automotive dealers try to gain the public’s good opinion, offering new technologies and styles, coaxing drivers with promises of better, faster miles. This is not an easy task. There are too many cars and too many innovations--all of which now flood the Internet. The automotive world has begun to understand the importance of social media. One Big Broadcast, however, recognizes the importance of social integration. Social Integration is the process of linking a specific site or post to the Internet, automatically updating networks and engines. Information is connected to targeted corners of the web, increasing chances for both visibility and appeal. This is essential for automotive dealers. Through integration they can reach out to the demographics they need, dominating traditional media sites (like Facebook, Twitter and Pinterest) or niche networks. This increases overall traffic, tempting users with the information they crave. Readerships and profits both expand. Social media is a vital component of everyday sales. Integration simply allows automotive dealers to fully embrace the possibilities and that is the foundation that we built our car dealer platform. The auto dealership has changed in break neck speed over the last few years. Today when new car buyers start looking for a new our used vehicle they grab their smartphones and start searching. As a dealer you’d better be part of the search results. As they get closer to their buying decision they start using other devices like iPads and Tablet even before they get to the lot. Once they get there – these are savvy buyers that know that the want. Here at OneBigBroadcast we’ve ‘lived’ with auto dealers to develop the planet’s best socially integrated auto dealer system and evolved with them to deliver the most effective real time dealer platform – our OBB Motors. It has paid off in spades. From integrating to a dealer’s back end to deliver vehicles to the Internet site as soon as they arrive to multiple social automation activity so every facet of the dealership has the most change of being the top of thousands of search terms when people start their automotive purchase journey – the dealership platform delivers. “We’ve not only harnessed the power of integrating multiple social media streams to attract thousands of visitors from mobile search but we’ve integrated the internal sales processes. When a dealership experiences a surge in web traffic the overall result is that the dealership becomes very busy"; recalls Steven Arsenault, CEO of OneBigBroadcast and a driving force behind OBB Motors. "We developed automated processes to deliver incoming inquiries to the right people so they can be followed up or booked for service. Vehicles that are ‘in a deal’ are auto flagged on the web site then re animated should the deal fall through or auto removed upon completion. Real time search based on exactly what customers are looking for are important as well – one of the reasons we developed advanced search options. Overall it’s the social integration that makes everything else work so well OBB Motors work. We’ve seen web traffic up over 400% and overall sales up 20%. That’s social integration in action if you can harness the power of social SEO and deliver huge traffic to an auto dealer. That’s what they are after overall. Contact us and let us take you for a drive and see how our platform can make a difference in your auto dealership. 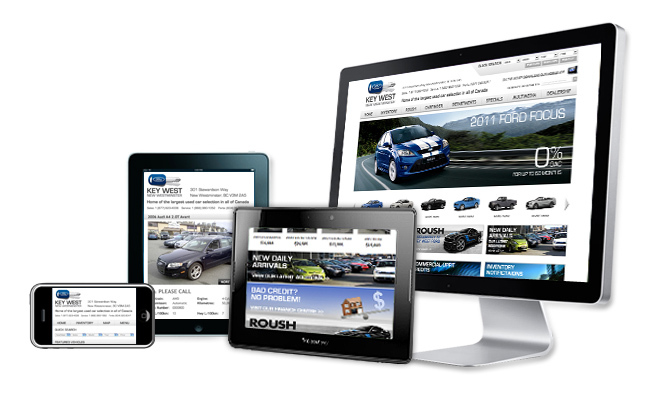 See an example of our work in the area of social platforms for automotive dealers. Think we are serious about the power of social automation in the automotive industry?